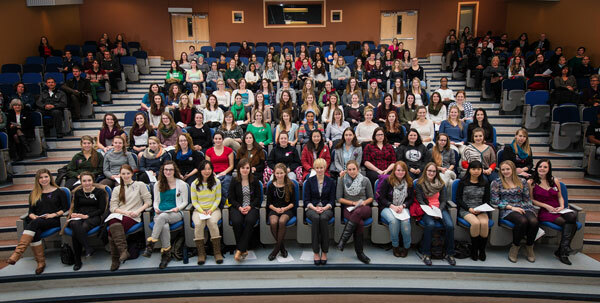 The University of New Brunswick’s Women in Engineering Society, University Women’s Centre and the faculty of engineering invite the public to join them in marking White Ribbon Day – a national day of remembrance and action on violence against women. This is an annual event commemorating the victims of the Montreal Massacre. This year the commemoration will also look towards the future of women in technology and engineering. The event will be held from 12:30 pm – 1:15 pm on Friday, December 4, in the Dineen Auditorium (Head Hall C-13) on UNB's Fredericton campus. Speaking at the event will be Stephanie Sanford, a senior consultant in the Crime Prevention and Policing Standards Branch within the New Brunswick Department of Public Safety. A UNB and Saint Thomas University (STU) alum, Sanford also teaches part-time in the departments of sociology and criminology and criminal justice at STU. Joining her will be sociologist Dr. Lori Leach, who will speak on women in STEM (Science, Technology, Engineering and Math). Dr. Leach is a strategic initiatives consultant with New Brunswick’s Department of Post-Secondary Education, Training and Labour. A memorial candle will be lit, and the first of 14 art pieces planned as a new UNB memorial will be unveiled. The remaining 13 art pieces and the complete memorial will be unveiled during next year’s commemoration.